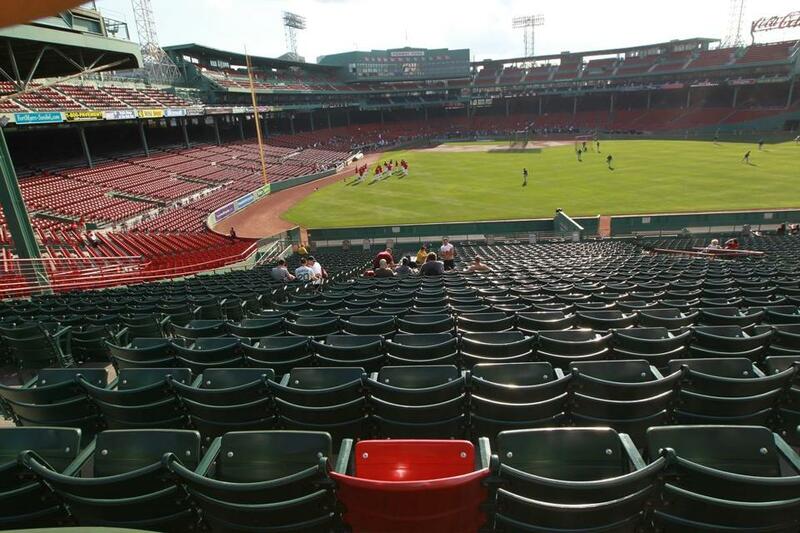 The red seat marks the spot of the longest home run ever hit at Fenway Park – 502 feet by Ted Williams on June 9, 1946. For a night, baseball’s defining distances will no longer be 60 feet, 6 inches or 90 feet. Instead, the attention will turn to the quest for more distant reaches during Monday’s Home Run Derby, and the anticipation that maybe, just maybe, someone will launch a ball 500 feet. It’s happened before, of course. Indeed, it’s happened at Fenway at least once — or so the single red seat in section 42, row 37, seat 21 suggests. Asked for his thoughts on whether anyone might have reached that remote location in Fenway Park, however, David Ortiz developed the first warning signs of the upper respiratory infection that sidelined him on Sunday amidst a brief spasm. The expulsion occurred twice, before Ortiz roared with laughter in the Sox dugout. Yet the historical record is fairly clear. 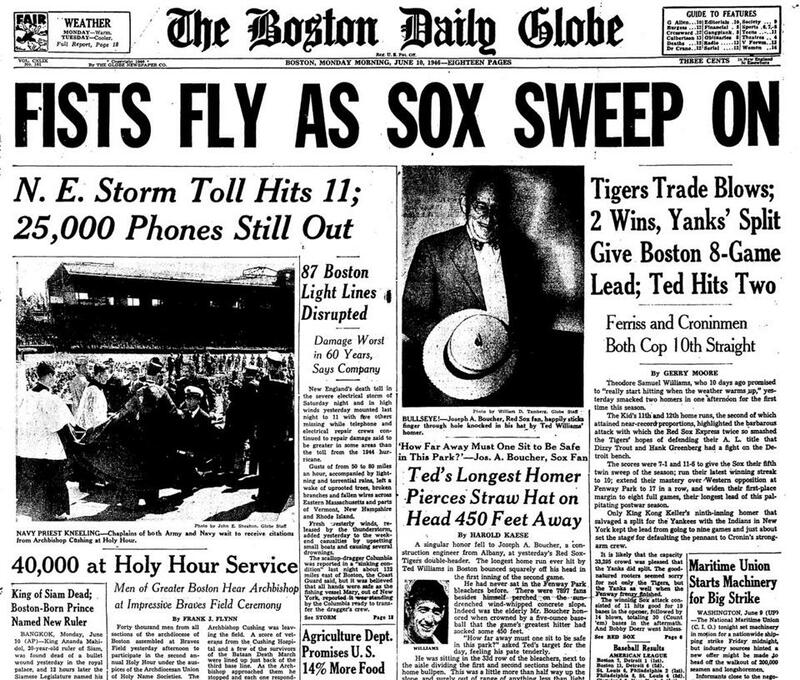 The front page of the Boston Globe on June 10, 1946, featured a picture of Joseph Boucher holding the straw hat that Ted Williams’s blast punctured while he sat in the famous seat. And Ortiz is correct that he’s never come particularly close to it — particularly when factoring in the actual distance the ball would have traveled had it returned to ground level, rather than traveling “just” the roughly 502 feet from home plate (the official distance quoted by the Sox in describing the distance it traveled) before bouncing off Boucher’s head. “If you adjust things so that the ball hits the red seat, 500 feet horizontal distance, 30 feet above ground level, then the ball would have gone about 535 feet,” said physicist Alan Nathan. An original estimate of Ted Williams’s legendary blast on June 9, 1946, was 450 feet, but it was later adjusted to 502. There’s no evidence that anyone at Fenway — especially in recent years — has approached the Williams blast. Other players throughout history — from Babe Ruth to Mickey Mantle to Reggie Jackson — have hit 500-footers — but they are exceptions rather than the rule. In 2006, Greg Rybarczyk — now a member of the Red Sox front office — launched his Hit Tracker website to measure the true distance of home runs. According to his website (now run by ESPN Stats), the longest Fenway homer since 2006 was a missile in 2014 launched by David Ortiz, which would have gone an estimated 484 feet had it returned to ground level. Assuming, then, that the blast was indeed as epic as the red seat suggests, two questions blare. How on earth did Williams hit a ball so far? And why, given the subsequent eras of supplements (legal and not) and weight lifting has no one come close to hitting the ball that far? “Maybe the wind helped, but it had to be a hurricane behind it,” insisted Ortiz. Not so. Rybarczyk once performed a fascinating analysis of the Williams wallop in which he found reports that the winds that day whistled at 18-24 miles per hour. Rybarczyk and Nathan both ran simulations using a wind estimate of roughly 21 m.p.h. Nathan estimated that, in order to take advantage of those wind currents, Williams blasted the ball at an unusually steep angle of 30 degrees, with increased hang time resulting in an increased opportunity for the wind to push the ball toward the far reaches of the park. With that angle and wind current, Nathan said, Williams would have had to hit the ball with an exit velocity of roughly 115 m.p.h. That is an impressive but not outlandish speed of the ball off the bat — according to BaseballSavant.com, there are 39 measured instances this year of players hitting the ball at 115 m.p.h. or greater. That said, the combination of a ball hit at 115 m.p.h. with a launch angle of 30 degrees for a homer doesn’t happen often. An unusual confluence of circumstances was needed to send Williams’s blast sailing about one-tenth of a mile from the plate: An extremely hard hit ball came off the bat at a high angle and then was pushed by an immense wind. The wind represents a particularly significant factor here, since in its absence, Nathan estimates that Williams’s homer would have gone “just” 440 feet — traveling roughly 90 feet less than it actually carried. That tremendous difference may also help to explain why no one has ever come close to hitting a ball anywhere close to the Williams seat. As mentioned in a 2006 article by the Globe’s Stan Grossfeld, the late-1980s construction of what is now known as the EMC Club — with the pressbox level on top of it — had a meaningful impact on the ability of wind to carry flyballs. True distance estimates feet ball would travel to return, uninterrupted, to field level from home plate. The extra levels of the ballpark have denied Ortiz a career of sending satellites surfing on the kind of wind current that carried Williams’s blast. But shouldn’t bigger and stronger mean farther at some level? Not necessarily. That helps to explain why a player such as Giancarlo Stanton has smashed pitches with elite exit velocity with considerably greater frequency than other hitters in the majors this year, but why he hasn’t left the rest of the baseball world in the dust regarding how hard he’s hit the ball. A perfectly squared baseball by a strong hitter simply doesn’t have access to a gear much beyond the one that the “Splendid Splinter” could employ in all of his rangy glory. So might anyone hit a ball a Williams-esque 530 feet on Monday night in the derby, or that someone might send a ball screaming out of the Great American Ball Park (a subject explored in by C. Trent Rosencrans for the Cincinnati Enquirer)? Don’t count on it. The weather forecast calls for rather pedestrian winds in the range of 5-7 m.p.h. True distance estimates feet ball would travel to return, uninterrupted, to field level from home plate. Standard distance removes wind, temperature, and altitude. Alex Speier can be reached at alex.speier@globe.com. Follow him on Twitter @alexspeier.